I need your personal information in order to provide the best and safest possible care. Your requesting treatment and my agreement to treat you constitutes a contract. You can refuse to provide information but I then, I cannot treat you and still be safe. I have a ‘legitimate interest’ in collecting information in order to be safe and effective. I also think it important to update you on matters related to your medical care. This, again, constitutes ‘legitimate interest’ but this time, it is your legitimate interest. Provided I have your consent, I will be able to send you relevant health advice or articles or signpost you to other therapies/practitioners. You may withdraw this consent at any time - just let me know by any convenient method. I have a legal obligation to retain records for 8 years after your most recent appointment (or age 25, if this is longer). After this period, you may ask me to delete your records. Otherwise, I may retain them indefinitely in order that I can provide the best possible care into the future. Your records are stored on paper, in a locked filing cabinet and the clinic door is locked twice. The office door is also locked out of working hours. ~ my associate working within this clinic if you come to her for treatment. You have the right to see what personal data I hold and you can ask me to correct factual errors. After eight years, you may also ask me to delete your records. If you have give me consent to treat your child/children, all of the above is also relevant to their personal data. I am doing everything I can to ensure your personal data is safe. If you have a complaint/concern about how your data is kept, please approach me and/or my associate so that we can liaise with you directly. We have recently added a puppy to our diminishing family. As the children leave home, the house seems to grow bigger so it is nice to have the extra company of a puppy. The puppy is truly lovely, but I had forgotten how much work they are and how they keep you awake, much like a newborn. I am suffering from that long forgotten sleep deprivation. Last week a mother came into the clinic tired and frustrated. She is breastfeeding her newborn and trying to do the best she can. She consulted books, friends, midwives and health visitors and everyone gave her different information. It just became depressing and confusing. She didn’t know who was right or which information to follow and some of it seemed to be in direct contradiction. I come across this a lot and it was all the more pertinent to me at this moment in time as I am trying to crate train my new puppy. I had tried this with a previous dog with disastrous results, mostly because I was following the advice of books I had read, or what the breeder had told me I should do. There was all sorts of advice and a lot of it was contradictory and some of it was darn right useless. For instance, one source said to get your puppy used to the crate each day and then, when they were happy it was their ‘den’, they could sleep in it. Well, so where is the puppy supposed to sleep BEFORE this? A puppy needs somewhere to sleep day one. Another source said to leave them to cry all night. Never go downstairs at night and never go to them when they are crying. Wait until they stop crying and then go to them. Well, how does that work if they are non-stop crying? So, that night I came home and did the same. That first night of leaving my puppy to cry in her crate was horrendous. So the second night, I decided to trust my instincts. When she cried, I came to her and took her outside. She relieved herself, crawled back in her crate, and went to sleep. She knew what she needed and I knew what she needed. It was so much simpler. So, sometimes, book advice and people advice can be useful. It can sometimes provide a broad guideline or structure on which to hang some of your own ideas. But, cherry pick. Use what ‘feels’ right to you and discard the rest. Our new babies are snowflakes. Each one is entirely unique and different. No one book or person will be able to identify exactly what your babies needs are or how and when they should be feeding. Because they are not the expert. You are. So, a mother came in the other day with her two year old who is suffering from glue ear - Chronic Otitis Media. Her toddler has been on and off antibiotics quite a lot this year and this mother was frustrated that this was all that was on offer and, it wasn’t helping. In fact, her doctor had said there was nothing more he could do and she was advised to ‘wait and see’ before rushing off to have grommets surgically inserted in each ear. She arrived in my office because someone reminded her that osteopathy might help. This is a common scenario for me. It hadn’t occurred to her to try osteopathy she said. This is also a common scenario. And it is because I am not allowed to advertise to be treating any ailment unless there is evidence-based practice to back up what I am doing. In other words, every ailment I propose to ‘treat’ osteopathically, will need to have gone through randomised blind trials or some sort of quantitative, scientifically authorised, study before I am able to advertise that I can treat it. In theory, this seems a sound way to authenticate what the public sees as a consumer product ie. paying for a service that will eliminate or reduce suffering. In practice, however, it all comes a little unstuck. For starters, osteopaths and the umbrella organisations to which we are obliged to belong, do not have vast sums of money nor time, to carry out trials; qualitative, quantitative or otherwise. NCOR, the osteopathic research arm, does as much as is physically possible but there are only a little over 5,000 osteopaths in the UK and it is not possible for such a small profession to self-fund research in this way. The other niggle is that large organisations, like pharmaceutical companies, that do have vast pots of money with which to do things like fund drug research, can STILL get it wrong! And do! The British Medical Journal published that the number of deaths from licensed drugs could be more than 10,000 each year and that’s just in the UK. This appears to be sort of an accepted fall-out, but I doubt osteopaths would still be in business if they had such startling side effects. Another problem is that osteopathic philosophy upholds a belief that each individual is just that; individual, so treatment is tailored to individual needs. This upends the strict control guidelines for research which, by its very nature, collects individuals and puts them into groups and then the ‘group’ is viewed as one organism, ie. a control group and a trial group. Let’s say the control group has no back pain and the trial group has low back pain. Can you see the obvious problem already? So, with this low back pain group, surely one can already be questioning how this is assessed. Where is their back pain exactly? What does it feel like? Is it constant? What is the quality? How long have they had it? What was the cause? What do they do for a living? What do they do in their free time? Are they happy? What car do they drive? Are they male? Female? Any surgeries? Accidents? Medications? Do you see where I am going with this? Osteopaths see so many variables in ‘grouping’ people together in this way that it no longer feels like a valid way to assess outcome. So, even if we had pots and pots of money with which to carry out research, we would need to use a different paradigm of assessment. I guess what I am trying to say, is that I may not be able to give you Evidence Based Practice all the time. NCOR is doing its best with publishing osteopathic research. And all the osteopaths I know, including myself, are all doing their best to help people feel better, to help alleviate suffering and pain, and by offering our clients a trial of treatment that may indeed, reduce a symptom picture. So, I’m not allowed tell you that I treat this ailment or that ailment like Otitis Media. The fact is, I don’t really treat Otitis Media, in isolation, as an entity on its own. But I DO treat your child as an entire person whose body is trying to deal with this affliction or any other. Osteopaths treat the individual, not the disease. And as a consequence, I have a steady stream of clients and their children whose ailments, according to them, appear to clear. They tell me their suffering is reduced and they are grateful. And this has been happening regularly for the last twenty five years. It seems to me that, this is a better outcome than a life wedded to taking medication and suffering chronic illness or pain. With or without a base of evidence. A young mother told to me the other day how her friend, another mother, stated that breastfeeding was a really selfish act on the part of a woman as it denies the father the chance to bond with his baby. She found this a sad reflection of how un-informed mothers are today. And indeed, it is truly a sad, misguided and mis-informed line of thinking. There are so many ways a father bonds with his new child. No other mammal, forfeits feeding her young so that the task can be shared. And yes, I know we differ dramatically from other mammals but we have mammary glands expressly for this purpose. I am not sitting in judgement on those women who choose not to breastfeed or are struggling to do so, but to deny your baby this most magic of suppers, this most delightfully ever changing intelligent elixir of life, just for the sole purpose of including dad in this one task, seems like an enormous mistake. It is a decision made without a proper education of how unique and wonderful breastmilk is. I am not admonishing this woman. She doesn’t know! It is like a secret, not to be told, except to an elite few. Why is this? Why isn’t the science of breastmilk right out there as common knowledge before the decision to have a child enters a woman’s consciousness? Why aren’t we teaching our young women about their own innate magic? Human breastmilk is specifically designed for human babies. It changes from feed to feed, from day to day according to the nutritional needs of your baby. There is a quiet choreography that occurs and baby gives signals to the mother’s body. Mother’s body picks up these cues and the milk is changed to meet the changing needs of baby. Yes, I know it sounds like science-fiction but isn’t that just marvelous? Breastmilk is anti-bacterial and also protects baby against certain pathogens. Also, there is a messaging system going on. Whilst baby feeds, bacteria are picked up and ‘read’ by the mother’s body which then makes antibodies to that pathogen, which is then fed back to the baby via her milk. Breastfeeding is an exchange of information which is necessary to start building a baby’s immune system. So all this furious exchange of information is going on in the secret silent world of the mother’s and baby’s immune system. There is a hormone in the gut that signals satiation and gives the baby that ‘milk drunk’ look. Mother and baby both release it during feeding. Baby gets a peak of this hormone after feeding and then again half an hour or and hour or so after feeding when milk reaches the GI tract. Between these peaks, baby may ‘wake’ again to feed some more (maybe 10 minutes or so after feeding but it varies) which is when they may finish feeding on one breast or may be offered the other. I call this ‘waking up for pudding’ after the main course. Around 30 minutes after ‘pudding’, mother’s can take advantage of the second hormone peak and put baby down for a nap. Breastmilk contains nutrients especially designed to enhance the growth of baby’s central nervous system and visual centres. Pre-term babies will get a different composition of breastmilk than a full term baby. And, here's more science fiction, because HOW does mother’s body know, but, this magic stuff is different for boys than for girls! That’s right. Boy babies receive milk that is higher in fat and protein. Breast milk can also be used to help eye infections, ear infections, and can help reduce itching and stinging, to mention a few health benefits other than nourishing baby. It’s like this miraculous gift from Mother Nature. I don’t want mothers who aren’t breastfeeding to feel intimidated or guilty or defensive reading this. That is not my intention. A decision not to breastfeed is an personal decision and I can only hope, an informed one. What is heartbreaking to me is a woman who says ‘she can’t or couldn’t breastfeed’. To me, this is a woman who wanted to and tried to, but did not have the right support network around her to offer her the assistance she needed. That is a failing of our society or our health system or our lack of offering education early on in life to our young women (and men). It is very rare that a woman is truly unable to breastfeed. However a decision NOT to breastfed based solely on the premise that it means dad can help feed the baby is a terrible indictment on how we are raising the next generation with next to no information on the miracle that is the vessel within which they reside. An elder came in the other day in a lot of pain and discomfort. She is of a generation that was evacuated during the war and has that stoical sense about her that ‘just gets on with things’. She is really healthy and trim and has beautiful skin. When I saw her, she had been suffering for about a week, and was in considerable pain and unable to sleep. Her GP told her she had ‘sciatica’. Ok. Sciatica is not a thing. It is not a proper diagnosis, but a word that describes a bundle of nerves that exits the spinal cord and serves the leg. 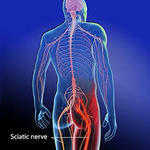 Everyone has a two sciatic nerves. Telling someone they have ‘sciatica’ is like telling someone they have a toothache. They KNOW they have sciatic pain. That’s why they have come. To tell them they have pain when they are sitting there agonizing through it, feels patronizing to me. The real question deserving of an answer is, why? So, it is okay for the doctor not to know why as there is more than one condition that can cause this terrible pain, but it does frustrate me that this lovely woman is palmed off with this ‘diagnosis of sciatica’ when it is not a diagnosis. I may not know exactly what the diagnosis is either, but it just seems to me that giving someone a ‘descriptive word’ does not help in easing their pain. The thing is, I can’t help wondering what steps would have been taken had she been 30 or 40 years younger. Many of the elders that come to me don’t seem to be getting the health service they deserve. I might be just super sensitive to this but it just sometimes seems that, because of their age, less is offered and more is put down to ‘old age’. She is healthy. She is fit. She takes no medications and gets plenty of exercise and fresh air. She is a vital participant in her community. She is not at the end of her life but we can’t pretend that she isn’t nearer to it. Still, it doesn’t mean she should go home and suffer this pain and stop living her very full and productive life. She isn’t less important than someone younger. I am not ending this with an answer to solve this problem. But it is an increasingly annoying situation to me that our elders seem to get swept to the curb as less important members of our society. We are all (hopefully, actually) going to get there and I am quite sure that we will expect to be treated with the same respect as anyone else. YOU MAY FIND LINKS TO: Osteopathic and Doula Resources.